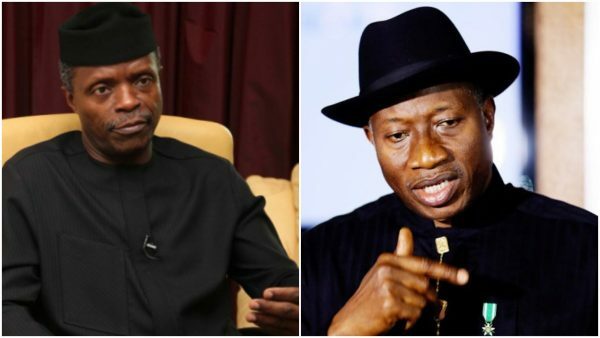 Former President Goodluck Ebele Jonathan has called on the General Overseer of the Redeemed Christian Church of God (RCCG), Pastor Enoch Adeboye to call Vice President Yemi Osinbajo to order for spreading falsehood against his person. In a statement released by the Goodluck Ebele Jonathan (GEJ) Media Office, Jonathan asked Osinbajo to respect his supposed pastoral calling and stop making unfounded allegations against him. Osinbajo had last week at ‘The Platform’, a programme organized by the Covenant Christian Centre in Lagos alleged that the sum of $3 billion was stolen by three unnamed persons in the Jonathan administration. On March 19, Osinbajo also alleged that the Jonathan administration shared ₦150 billion two weeks before the 2015 elections while it spent a paltry ₦14 billion on agriculture in 2014, ₦15 billion on transportation and only ₦153 billion on infrastructure in three years. In the statement, Jonathan also recalled that Professor Osinbajo falsely alleged that he took ₦100 billion from the Central Bank of Nigeria (CBN) in cash to his personal residence in Abuja but could not provide proof of his claims when asked to do so. It added: “Faced with these facts, a desperate Buhari administration, wanting to be re-elected and knowing that it cannot run on its record, has devised a plan to distract attention from its woeful record of failure by making constant false allegations on my person.